Through StanTours, I had arranged a 4WD, driver and guide for the trip, about 150 miles North from Ashgabat across the Karakum desert. 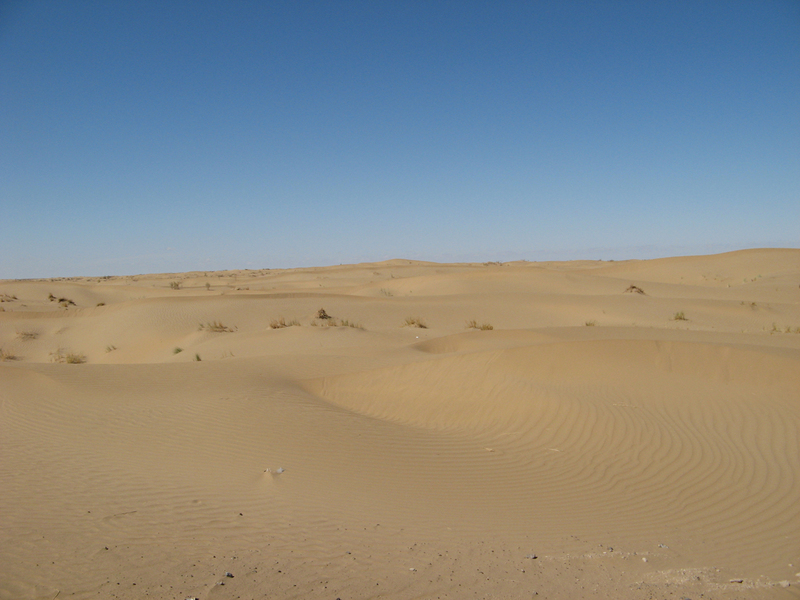 The Karakum desert is known as the “black sand” desert, but I’m afraid the sand looked regular sand colour to me. 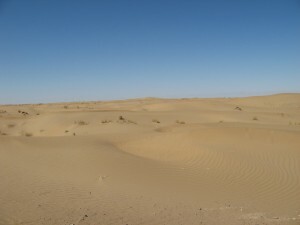 Most of the desert was scrubby desert, with occasional small shrubs, like the outer parts of the Taklamakan. But there were occasional sections of pure sand. We visited three craters. The first was a deep crater with a pool with green water at the bottom, with small bubbles of gas bubbling up. The second was another deep crater with a pool of mud at the bottom, bubbling merrily and emitting gas. This was quite interesting. 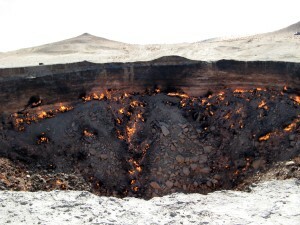 The third and by far the largest, was the Darvaza gas crater itself, eight km east of the road. This was about 40 meters across and perhaps 20 meters deep. The sides and bottom were lined with flames from many fault lines in the rock. It was bright daylight, so it was all relatively subdued, but it was still very cool. 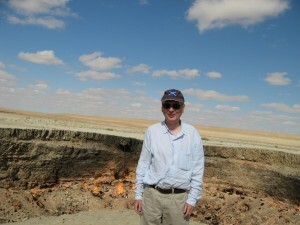 There was a dull roar of sound from the fires and much heat from the crater. I walked around it and when I was downwind, it was oven-like. I could see pipes leading into the top of the crater, so my suspicion is that this was a working gas hole, which blew, destroying the top section. 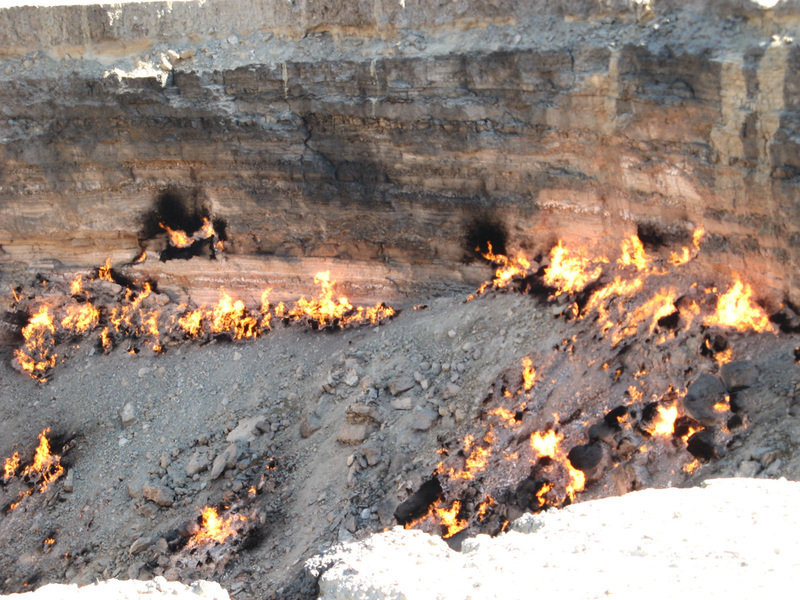 But perhaps the deeper drill pipe hole is still open, which is making it easy for gas to get near the surface and it then percolates up through the loose rock in the crater? 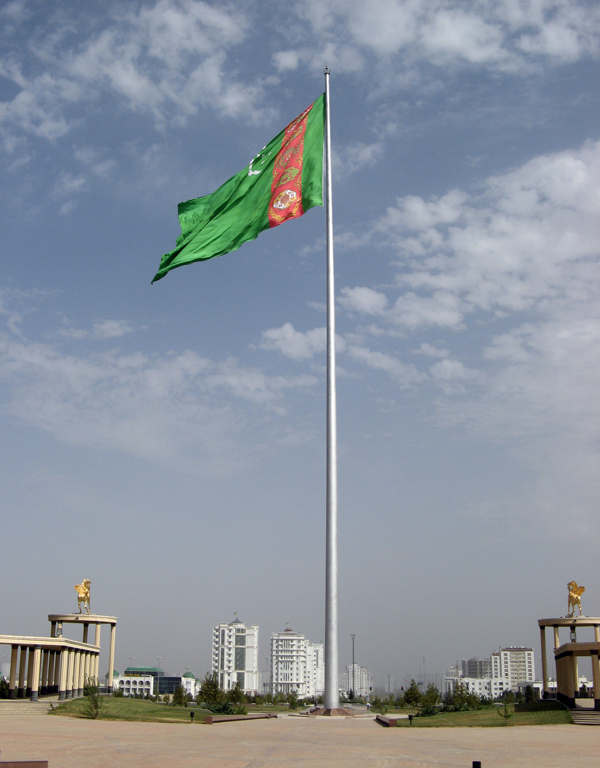 Turkmenistan is by far the strangest of the ex-soviet Republics. 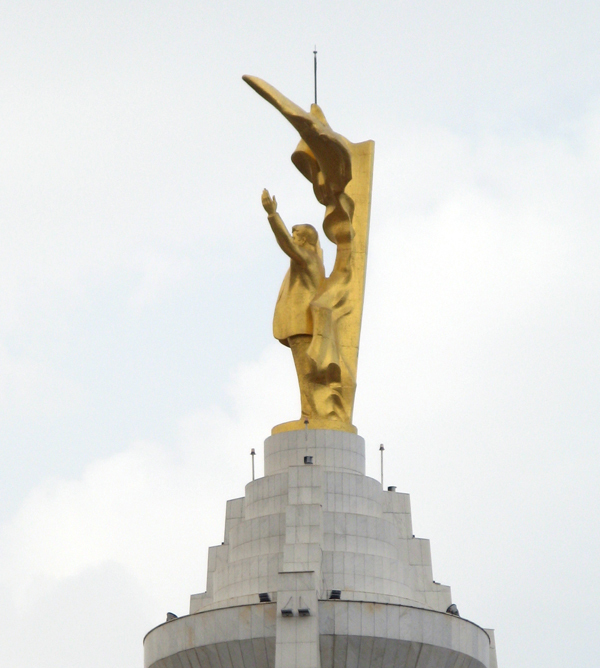 The late President Niyazov (aka “Turkmenbashi”) ruled as an absolute monarch, with a personality cult that would have made Stalin blush. 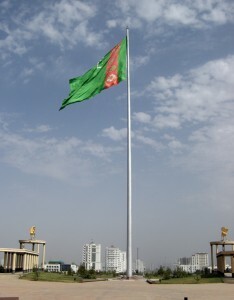 Strange relics of his reign still dot Ashgabat. 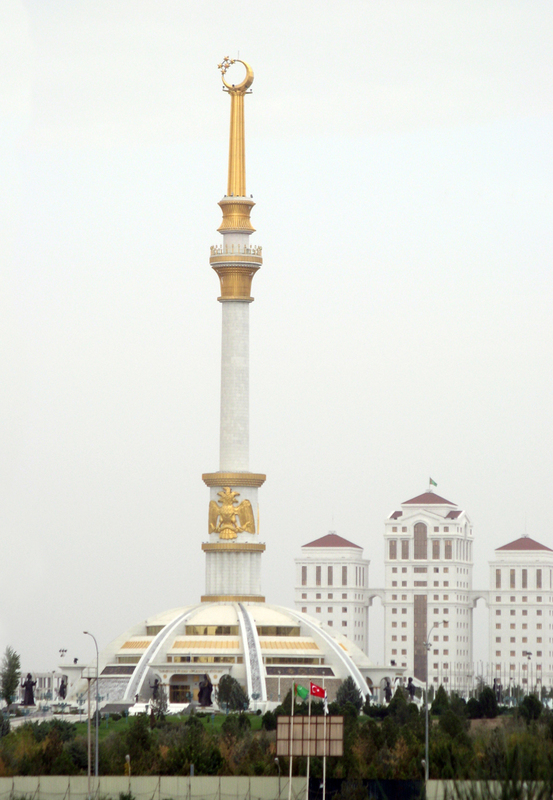 The Arch of Neutrality is a 75 meter tripod tower, adorned with a 12 meter golden statue of the late God-King President Niyazov. The golden statue rotates through the course of the day, so that the God-King President is always facing the Sun and so that he dispenses his blessings equally to all points of the compass. 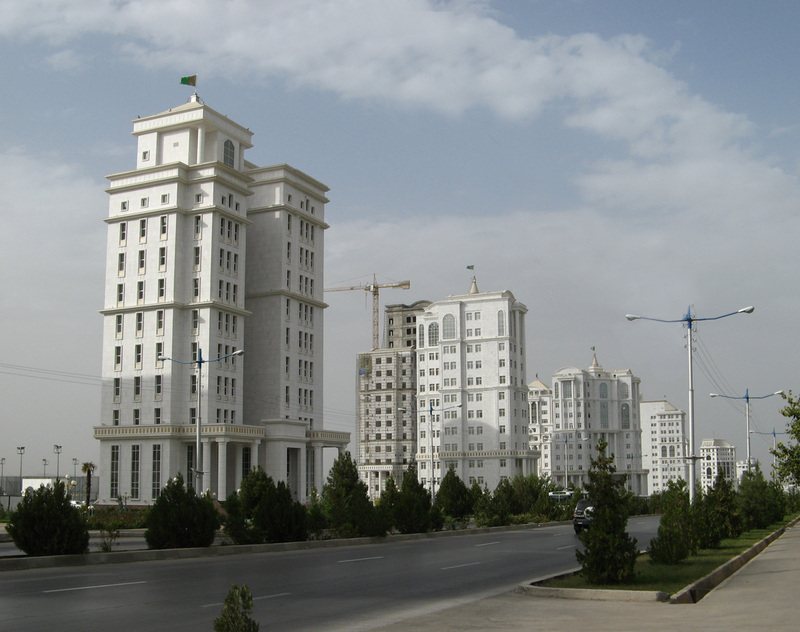 Ashgabat suffered a devastating earthquake in 1948, killing perhaps as many as 100,000 people, including President Niyazov’s mother. 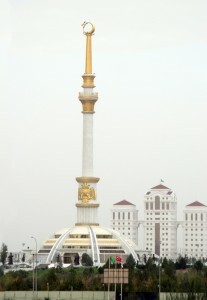 But miraculously the infant Niyazov survived. 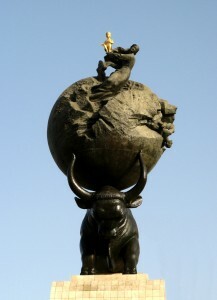 The local statue of Lenin is comparatively modest. 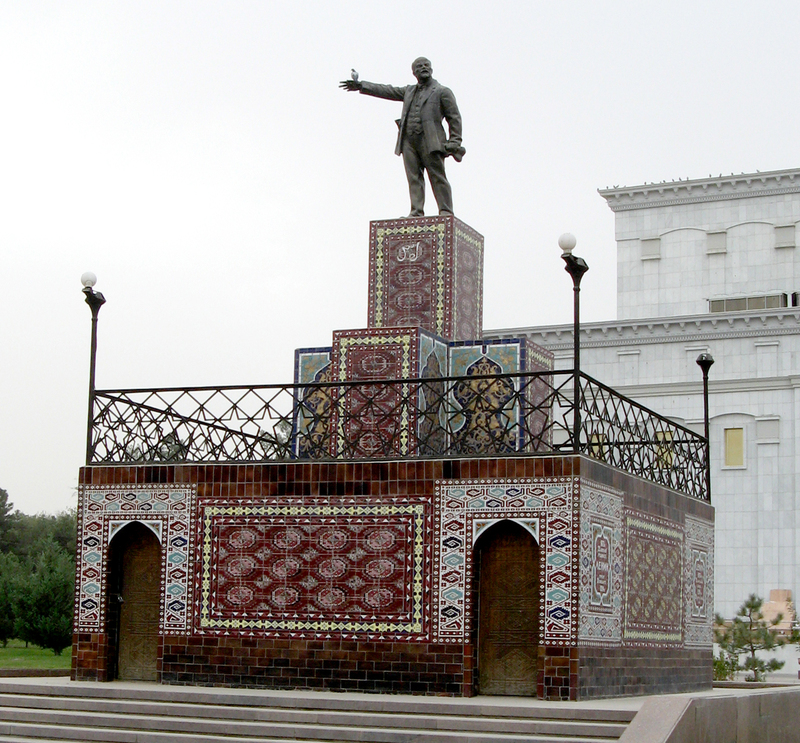 It is however distinguished in having an impressive tiled plinth, in a Central Asian style with Lenin’s name in flowing Turkmenistan letters. 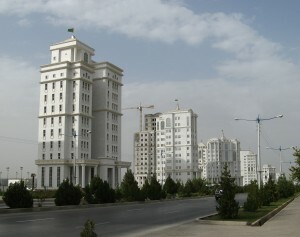 Ashgabad’s new city area has broad avenues of tall white “marble” apartment buildings. 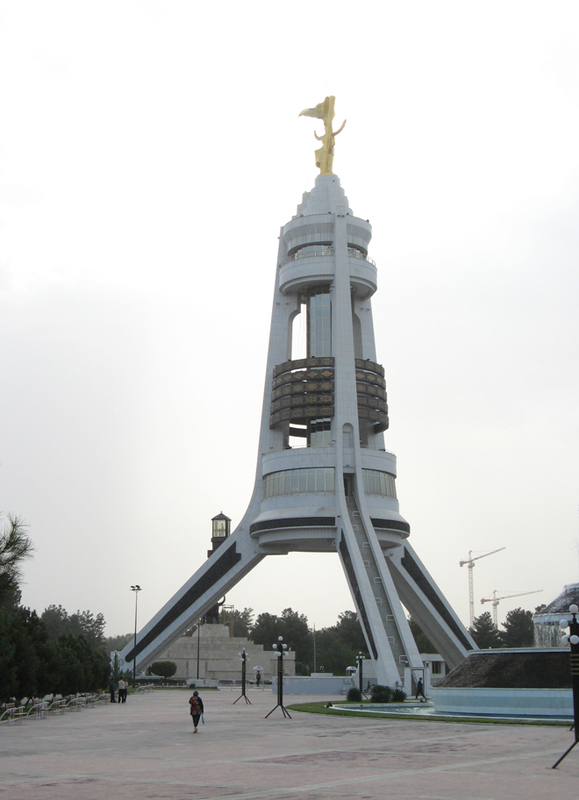 It clearly aspires to be futuristic, but it looks like a 1950’s vision of a Soviet Model City. I much prefer Astana’s more daring vision.